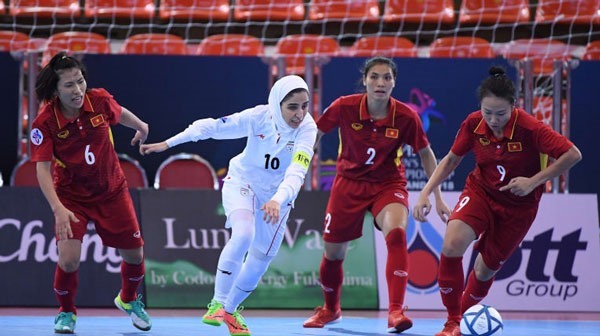 HÀ NỘI — Việt Nam lost to defending champions Iran by five goals to zero in the semi-finals of the AFC Women’s Futsal Championships at Bangkok Arena in Thailand yesterday. With better skills and physical strength, Iran controlled the game from the opening minutes. Defender Arzhangi slotted the opener for Iran in the fourth minute. Despite this early goal, Việt Nam came out strong searching for an equaliser, but in the ninth minute, striker Shirbeigi doubled the score for Iran. Just four minutes following Shirbeigi’s goal, Iran raised the score to 3-0. With just few minutes remaining of first half, despite playing with great efforts, Việt Nam couldn’t prevent Iran from scoring one more goal to put the game virtually out of reach at half-time. After the break, Việt Nam pressed to at least find the net but couldn’t manage a goal. Iran made it five before the final whistle. “Iran are a very strong team in Asia. I was sorry to say that my players were afraid of Iran so the team didn’t perform well in the whole first half,” said Vietnamese coach Trương Quốc Tuấn after the match. “At the break, the training board changed tactics to help Vietnamese girls play better in the second half. It is the first time Việt Nam have played in the AFC’s semi-finals so they were worried, especially young players,” Tuấn added. While coach Shahrzad Mozafar said it was the best game of Iran in this year’s event.